Well, I was going to wait until Friday to post this, but I just finished my card and I wanted to share it right away. You know that mentality, right? You may recognize it if you have similar inspiration files to me-I really love this card by Maile Belles and I also can't wait to get my hands on her new stamp set, Modern Basics. 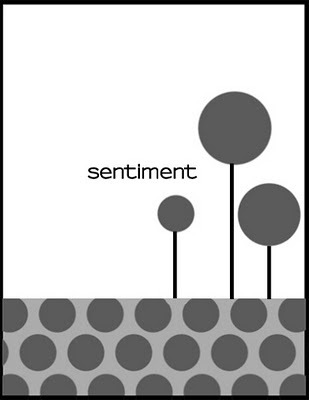 In the mean time, I figured I'd use one of my modern style favorites, Dot Spot, to make a similar look. I also am posting early so I can enter my card into Heather's Totally Hues Challenge #3 before the deadline! The colours to use are Hawaiian Shores, Aqua Mist, Orange Zest, and Summer Sunrise. I found them just perfect for this blustery, snowy day! As always, if you play along, feel free to leave a link to your post! super fun sketch- I love how you used those little bursts as flowers. Fun color combo also! Your card is so stunning!! I love this sketch!! What a fun sketch! Thanks! loved this sketch! So glad I had a chance to play this week. Great sketch, had such fun playing along. Thanks for such a cute sketch!! Thank you for another fun sketch! 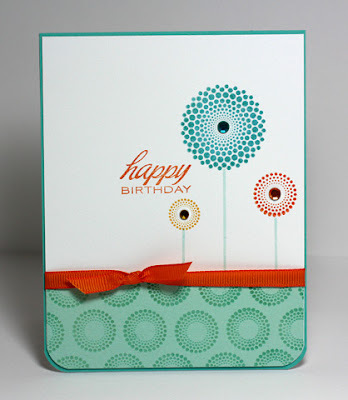 Love your card - what a cool colour combo! Love your card and I LOVED this sketch!!! Thanks for the inspiration!! such a perfect sketch... and just great cards linked up! !